After what seems like years of anticipation, the official winner of the Independent Foreign Fiction Prize was awarded last night, in the presence of a host of literary stars (well, Stu, David and Jacqui were there, anyway). 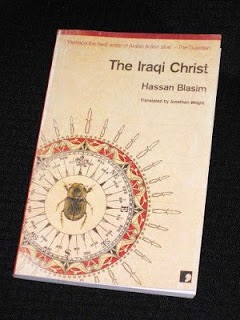 The name that was eventually pulled out of the envelope was Hassan Blasim’s The Iraqi Christ, translated by Jonathan Wright – congratulations! A while back I expounded on this a little in my post on the differences between the IFFP and the American version, the Best Translated Book Award. While the BTBA has its own issues (as the amount of fiction available in translation increases, its anyone-can-enter ethos is bound to come under pressure), I do feel that the American version is slightly more daring than the IFFP, with the writing prized more highly than any political concerns. An excellent summary, Tony. It's been a great experience to participate and exchange thoughts on the books with you and other shadowers. It was lovely to meet Stu and David in the flesh yesterday afternoon, but I headed off to a different literary event yesterday evening – a reading from Andrés Neuman. And it was every bit as wonderful as you might expect from your own experience of meeting him! Thanks Tony (and the shadow panel). It has been really interesting to have followed all your reviews of the books mentioned for this prize. I haven't paid much attention to Translated Fiction but now am much more appreciative of it and will look out for it more. Have really enjoyed this whole thread of blog posts. I like how you say we need to keep our eye on the professionals, so to speak. And, it's hard for me not to feel there's most definitely a political agenda. I can't express my personal disappointment in the “official” judges' opinions. It was to such an extent that I had trouble finishing their short list; mu favorites were definitely not included. However, it was so wonderful to participate with the Shadow Jury. I respect each member's opinion implicitly, and am not the least surprised that we almost unanimously agreed on our (rightful) winner. Jacqui – Lucky you 🙂 I'd love to make it there one day (and it'd be great to catch up with Andrés again- I'm most envious!). The shadow season series was gripping and I have to say got my attention much more than the official program, not just the brilliant reviews but the regular interactive conversation on twitter which made it so much more alive. Well done and look forward to following you all again next year and reading some great books in the meantime. Claire – Thanks 🙂 The aim of the whole exercise is to raise awareness, so it's good to hear that we're getting through to people. Let's hope next year is as successful! Anya – It's a labour of love, and I always enjoy doing it (although once a year is quite enough…)!